I had planned to rest today after yesterday's first time back to painting after all the challenges I have been through lately. I was skimming my Facebook page this morning and I saw a storm warning posted by our local weather guru. Coming in tomorrow will be high winds and a lot of rain. In other words, another fall storm. Today was a lovely warm fall day coupled with that underlying uneasy feeling that the sun just doesn't quite feel right, as if it is slightly off. 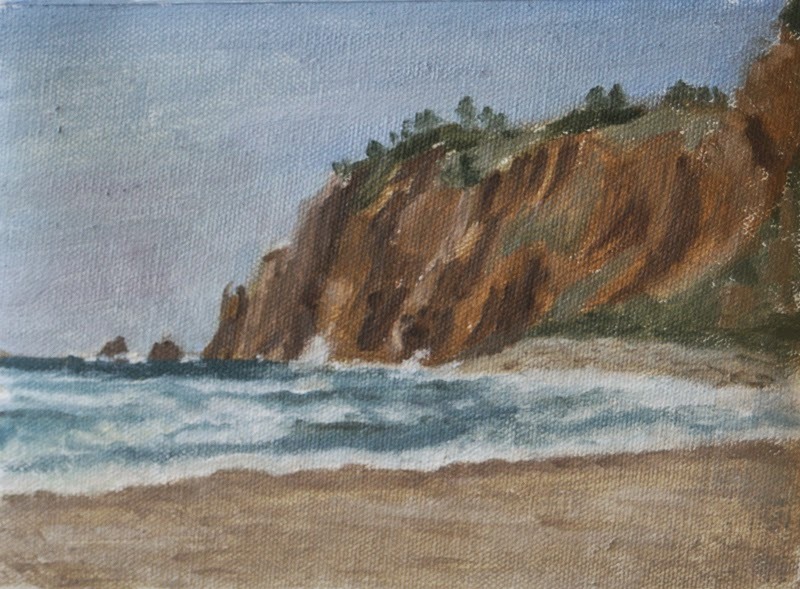 It looks like the weather won't be very cooperative for painting on the beach for a few days so I decided to go out and paint again. I am still shaking off the cobwebs on my painting skills so I decided to try something different. I usually paint near the foot, or perhaps I should say toe of Neahkahnie Mountain. I decided to paint the toe portion that runs out into the sea. The mountain continues up twice as high as the toe and shelters our little town from some of the storms that come our way. Here is my effort after 2 hours of painting. The water along the shoreline is not finished. This time of the year the sun starts to dip lower on the horizon and the golden light of fall hits the cliffs. We are able to see just how rugged the cliffs of Neahkahnie are. The shadows were changing literally every minute. It was challenging because I would look, then paint while looking at my canvas, and then look again and find that things changed. I will have to paint it again and get more practice. 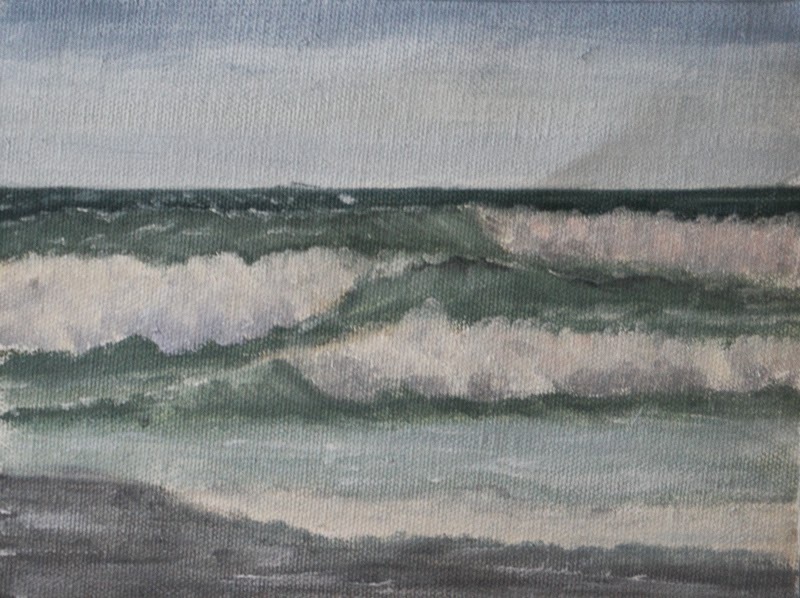 I wanted to paint a wave study too in the final hour so I broke off painting after two hours. There is still more to paint before I would call it a finished study. In addition to outdoor painting challenges, I grabbed a different tube of white paint that was not cooperative. The white paint was incredibly sticky and thick and fought me all the way. Ugh. I will be taking it out of my plein air paint kit. I am thinking of using this one to create a finished painting from. I like the way the waves were stacking on top of one another and going at different angles. The extreme lighting and glare lent added difficulty. My farthest swell is still looking a little too even. I was concentrating on getting the color and light effects on canvas. I will have to keep working on it. Tomorrow after battening down the hatches, I will be working in the studio. I want to take one day a week to work on basic skills such as drawing, color matching, brush strokes, etc. If the storm delays a bit I might be able to squeeze another wave study in too.